Tanya Dutt: Have you seen any outstanding innovation that represents/interprets culture? “Art can be a tool to imagine and co-create the world. A museum can be a lab to identify and incubate new collective behaviours, to co-create and articulate visions and pathways for desired alternative futures. A museum can be a lab for social and cultural innovation towards sustainable development. Bridging two worlds using a business model innovation approach, in mid 2014 the decision was taken to structurally develop a new value creation stream targeting business. It was started under the notion: ‘art inspired innovation for sustainable development’. After a brief analysis of the institutional structure and culture it was decided to develop the new value creation stream in a ‘learning by doing’ way as a Business Model Innovation (BMI) project. Following this approach the project team – a multi-disciplinary team representing all functions in the museum – experienced their future customers’ way of thinking. At the same time it started to learn their language. ‘Response-ability’ is the ability to consciously and sensibly deal with an unknown situation beyond unconscious, inherited re-action. The ability to choose the action that is meaningful and most effective towards a certain desired outcome – the ability to respond appropriately. Art as tool to build new response-ability seems to be a promising concept. Art can empower both individuals and groups to change perspective and build confidence. It can service creative leadership of effective teams, inspire lateral thinking, increase cultural context awareness, help to develop dialogue, deep viewing and deep listening skills. Art is a means to connect with individual and collective emotions. Experience shows that people’s behaviour and habits towards sustainable development only change with intense emotional and practical experiences (Shrivastava et. al 2012). Artworks can become tools for imagining and co-producing the world otherwise both by enabling different thoughts and instigating emotional entanglements. 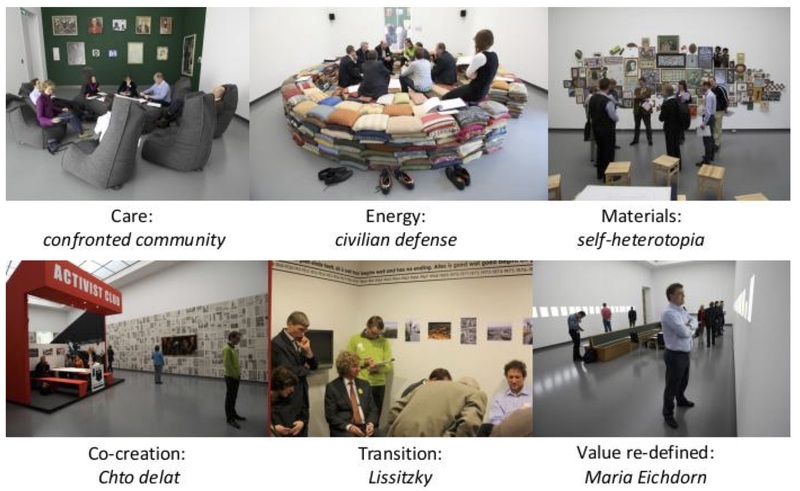 Museum as lab to develop new collective response-ability seems to be a viable concept. Museums through their traditional role of collecting, archiving, presenting, researching and mediating cultural artefacts have the role to create and safeguard social memory. They store and incubate seeds of cultural ideas. They can use their competencies to consciously tap into the collective memory and uncover historic pattern that can be beneficial to solve present problems. They can show context appropriate pathways into the future. Hereby, they can inspire a collective change of perspective, develop new (cultural) insight, and incubate new social behaviours. It might be useful to engage with artists as reality-mirrors, culture-sensors, language shapers, fore-sight creators, warriors, lateral thinkers, thought provokers, etc. Seeing multi-dimensionality and listening to multiple perspectives is a new core capability for co-creating complex systems. Artists often capture the ‘fever of the time’ in their works and provide an experiential form: a new non-verbal language that makes it accessible emotionally in times when appropriate words for speech-based communication has not yet been developed. In other words artists create tools to sense, witness and capture (social) reality, comparable to scientists translating observations of nature into mathematical formulas. If you are interested in reading more about Philip’s joinery to integrate innovation and sustainability, I can very much recommend the book Dorothea has written on this journey, from a personal perspective. Or this article which also captures some of the essence. Tanya Dutt: How are planners, creative entrepreneurs, artists and developers linked through the development process of a CCI (Cultural and Creative Industries) regeneration plan? Can innovation be brought into civic planning through pooling in creative people and involving them in the planning processes? Dr. Bettina von Stamm: I am not quite sure how this would be done, but I certainly think that bringing creative people into the process would be helpful. To succeed, proper facilitation would be required to create bridges, avoid miscommunication, and ensure that the different parties have a chance to make their unique contribution. A big challenge is always how to integrate diverse bodies of knowledge in such a way that the result is more than the sum of its parts. I strongly believe that the potential of such collaboration is to make one plus one plus one equal ten. The reality is often that one plus one plus one equals one. TD: How can we innovate without losing the core of culture? Is innovation confined to the way we can present/preserve culture? BvS: Any innovation benefits from boundaries/constraints; the core of culture and its authenticity can be such a boundary or even a reference point. A great friend of mine, Natalie Turner, has developed a framework bringing the steps of the innovation journey together with the different mindsets required at each step. At the core of the framework sits ‘purpose’; this purpose, defined at the outset of a project, becomes the touch stone against which all decisions over the course of the journey are assessed – have a look at www.6-i-innovation.com. I am rather proud to be the first certified practitioner, so perhaps that might create an opportunity for collaboration in the future! TD: What are innovative means of funding projects, any interesting case study to cite? BvS: I guess it will not be the locals who would be able to pay. However, perhaps art can be auctioned off online to raise funds – another friend of mine, Ulrike Reinhard who is behind Janwaar Castle, a skate park in rural central India that engages youth and facilitates girl empowerment, has auctioned off skateboards decorated and donated by artists; you can read about it here or watch a video to find out more about it. TD: When constantly reinventing oneself can we lose our core focus, our meaning? How much is too much? Is there such a thing? BvS: There is, absolutely. I started to talk about ‘the dark side of innovation’ back in 2011. Innovation has to create VALUE, we need to know what we want to keep, and where we want to push boundaries, create something new, i.e. : the boundaries I mentioned earlier. This also means knowing what to let go. Tanya Dutt: From politician, to planner, to artist, to architect – how does innovation filter through in creative and cultural regeneration? Is there anything like a bottom-top approach to innovation? Dr Bettina von Stamm: I definitely believe in bottom up innovation, particularly at the societal level. This kind of innovation in particular can threaten a leader’s authority, and challenge their (illusion of) control; therefore it can be difficult to achieve. We should also not forget, with bottom-up innovation – whether in society or in an organisation – the leaders still need to allow it to happen, whether proactively by creating the right conditions, or passively, by not interfering with what is going on. TD: How important is innovation as a factor while creating complex regeneration plans? BvS: I believe that understanding and embracing the complexity is the most critical part. To innovate successfully in complexity, we need to understand what is connected with what, and who with whom. Only when we understand and embrace complexity can we innovate within and beyond. TD: In cities in the UK are there physical spaces dedicated to innovation? What about inside offices or within companies? Do they have an innovative-thinking/meeting spaces designated? BvS: Many organisations have an innovation lab, on- or off-site for this. For example, Philips in the Netherlands were fundamental to the setting up of the High Tech Campus Eindhoven, a place where it connects with researchers, developers and entrepreneurs who are developing future technologies and products. Increasingly there are also ‘open’ spaces for entrepreneurs, start-ups and micro organisations such as Impact Hub, are such spaces of creativity. TD: Are there a good percentage of arts, culture or social organisations in the UK aiming to or taking steps towards bringing in innovation? What is the role of trusts and art foundations or cultural institutions in fostering innovation in our society? BvS: Innovation is on everyone’s agenda – how much of this is reflected in practice is another question though. The RSA, which was founded during the enlightenment by William Shipley, is one example of an organisation that has taken it as its challenge to innovate for society; the Van Abbe Museum in the Netherlands that I mentioned earlier is another. TD: Are we really using space innovatively? BvS: I don’t think so, not as a rule, only as exception. It is also not about creating innovative spaces to be innovative. Innovation should serve a purpose. Innovation for the sake of it is not enough. TD: What innovation can be brought into transportation to make it a more interactive experience, to involve people further in culture, and involve them into deeper and more remote parts of the country? BvS: This sounds interesting – and in all likelihood it will work where people have a little time to spare. It should be explored and opportunities for interventions could arise. TD: Are all innovations aimed at increasing profitability or is it seen more as a problem solving tool? BvS: Innovation is the process by which we change the status who. While most innovations are commercially driven, since the early 2000s the term ‘social innovation’ has spread. Of course, social innovation has always happened but it is since then that we aim to understand it better, and be more proactive about it. The Young Foundation has published a great paper on Social Innovation which is available online. I strongly believe that innovation today, any innovation, which does not at least consider all three aspects of the triple bottom line, is irresponsible. TD: Can anyone and everyone be innovative if they are encouraged in the right way or is it usually a specific team that develops new innovative action or process? BvS: Absolutely. Anyone is creative and innovative, just in different ways. We all solve the problems we are facing on a daily basis, as children we are particularly creative – until it is educated out of us. It is more about how creative we perceive ourselves to be; this will influence whether or not, and the degree to which we demonstrate creativity and innovativeness. TD: Is innovation mostly a capital or corporate realm goal? How can we change this to include the public, communities and governments? BvS: There is a lot happening already; a former student of mine is working with a concept called ‘Citizenpreneurship’ – a term that also seems to be used in the Netherlands, and a main academic focus of another colleague of mine, Dennis Hilgers, is on open government. TD: How can we make innovation more permanent in our processes or institutions, rather than a one-time process? BvS: Fundamentally, innovation happens in the presence of certain values and behaviours; it is a mindset that needs to be understood by leaders, whose role it then is to create the right conditions where such a mindset can develop and flourish. TD: How great is the correlation between innovation and economics? BvS: There is a lot of evidence that those organisations that have integrated innovation into their DNA do better than those who don’t – the same with design, the British Design Council has just published a report with the latest evidence. TD: Can we term the union of art/design/craft and manufacturing/commerce as innovation? Is innovation merely marrying creativity to commerce rather than keeping them distinct of one another? BvS: I would rather say innovation is ‘translating a creative thought/idea into reality’. Just having a great idea or being creative is not enough though; the purpose of innovation should be to change things, for the better (often it is just changing things). TD: In your experience, are arts and culture organisations naturally equipped with an innovation toolkit or do the management of such organisations also require guidance in innovative thinking and development? BvS: It is no guarantee but a good starting point. TD: How active are cross sector/discipline collaborations in the UK in order to instigate greater innovation? BvS: I am not sure but in my view whatever it is, it is not enough. The kind of innovation we need to move towards is sustainability (in the environmental and social sense), requires extensive ‘collaboration across communities’, as I call it. TD: Is innovation delivering cultural and community value or only economic value? BvS: In my view we can no longer afford to innovate in a way that only satisfies the bottom line. It is increasingly irresponsible. All innovation should keep all three aspects of the triple bottom line in mind, i.e. : planet, people as well as profit. TD: Should innovative process first find and address existing gaps? BvS: It depends on the gap but generally, not necessarily. TD: What’s a good percentage of an organisation’s profits to be diverted back into innovation? BvS: Depends on the context, the organisation and its innovation ambition. Tanya Dutt: Is innovation necessarily focused at the short term or does it encapsulate long term projects and planning as well – say 50 years? Dr. Bettina von Stamm: Most (radical) innovation rends to be longer term; it is incremental innovation that tends to be short term. Tanya Dutt is the founder of CultureClean, an initiative for sustainable community development through creative exchange and cultural endeavour. As an arts and Culture manager for creative industries, she has lived and worked in Japan, Italy, Cambodia, Australia, UK and remote parts of India. She focuses on crafts and community development which earned her the 2017 ATSA Fellowship. Dr Bettina von Stamm, authority on innovative practice in business hails from Germany, lives in the UK, and practices around the globe. The following conversation with Tanya Dutt (arts and culture professional from India) explores the influences that art and culture have on innovation today, and vice versa. In 2004 she founded the Innovation Leadership Forum (ILF), a Think & Do Tank dedicated to helping organisations understand and improve their innovation performance. As an innovation catalyst she has developed a number of tools, such as the Innovation Wave®, a tool for the facilitated assessment of innovation capabilities. Do you have any questions or thoughts in the context of innovation then please get in touch!